With industrial and residential expansion, the Kathu North and South intersections were experiencing significant increases in traffic volumes, which further compromised safety and road capacity. The total project cost is R66-million, of which 23% was earmarked for SMME contractor development. In evaluating the safety and capacity of the N14 between Olifantshoek and Kathu, SANRAL set out to improve and upgrade three intersections – Olifantshoek, Kathu South and Kathu North. 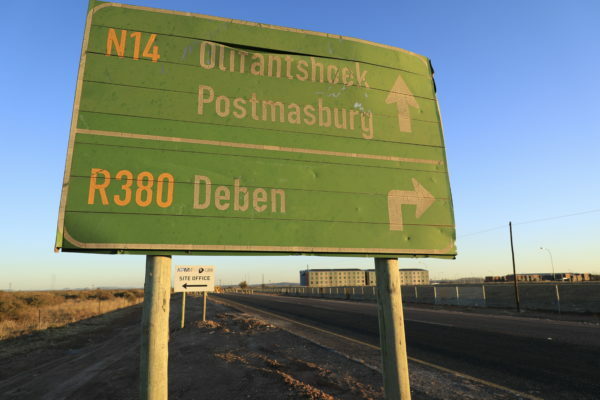 Friedl van der Merwe, SANRAL Project Manager, said: “The intersections were considered unsafe for motorists, as those travelling from Olifantshoek on the N14 would have to come to a complete stop at the intersection to either turn left towards Kathu or right onto the R325 towards Postmasburg. “Chicanes are in place to slow down particularly heavy trucks approaching the intersections and special attention was also given to pedestrian safety by incorporating sidewalks for safer pedestrian access,” said Steven Gerber Resident Engineer from GIBB Consulting Engineers. Furthermore, SMMEs were sourced from the surrounding communities and, where needed, attention was given to capacity building and skills development. “When I initially came on board this project, I had limited knowledge and experience in road construction, but thanks to the training and development I am doing far more advanced work,” said Lazarus Phala, one of the SMME subcontractors on the project. This project also incorporates a partnership with the Northern Cape Department of Roads and Public Works, which saw SANRAL take care of the repair, widening and re-seal of approximately 3.5km of the R380, which forms part of the Western leg of the Kathu South Intersection. Construction started in August 2017, and it is anticipated that work will be completed early in 2019. A video link to this project can be found here.